On Saturday 4th November, we spent the day filming Bridgwater Carnival from 10:30am until 11:30pm to capture the events leading up to, and then the main Bridgwater Carnival procession. The next three days were spent editing the footage for the DVD & releases. Mark edited the 2+ hour carnival procession, using the recorded live mix as a basis and editing in any additional shots required (different angles of walking entries or replacing any shots where digital distortion may have been picked up from the roaming camera). Meanwhile Stu mixed a live Stereo mix and also mixed a separate version with optional live commentary. Stu also edited a daytime highlights reel for the DVD intro and created the credits/results roll for the end. On Tuesday members of the Carnival committee visited the office for a 1st viewing (They were very happy), after which we spent the rest the day finishing off the DVD master for delivery to the replicators on Wednesday morning. This was a huge edit with a very short turnaround but we were able to get it all done in time and the event organisers were very happy with the final product. The DVD contains the full 2 hour procession which culminates in the famous Squibbing. Viewers can watch the procession with live audio, or with the optional commentary track. Sadly the organisers decided not to create a Blu-ray this year, as the sales of the Blu-ray option have not been high enough in the last 3 years to justify the extra time to create it. 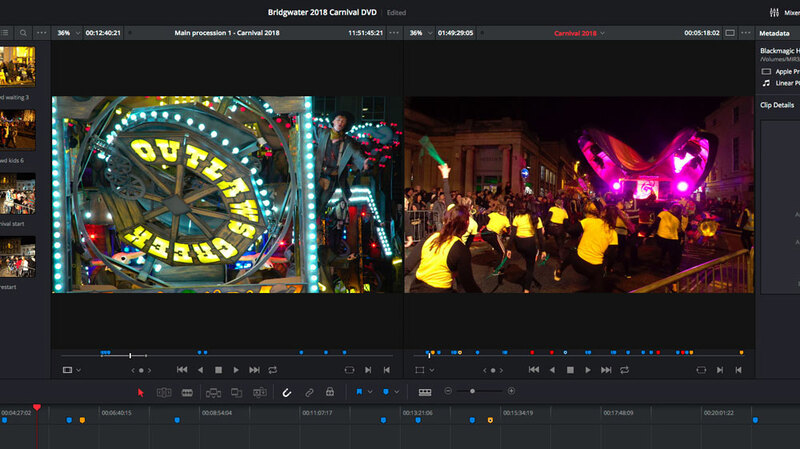 AS well as the DVD, we have also created a timelapse video which shows the whole processing in just over 2 minutes, a 3 min promo film for the DVD & next years carnival and also a few extra films for advertisers. Once again the organisers were very pleased with the results and we are really looking forward to being back next year.